Boneset herb (Eupatoria perfoliatum) is a perennial native of northeastern America and was commonly used by the Native Americans living there. It likes to ‘keep its feet wet’ by growing in the margins of swamps, marshlands and streams. The leaves are slightly rough and serrated and grow alternately, joining at the stem as if one leaf. It can grow up to 5 feet and then has clumps of small bone-white flowers that are coveted by bees. The leaves and tops are used and gathered at the beginning of flowering. If harvested earlier or later, then only the leaves are gathered. European settlers were taught by Native Americans, how to use boneset for influenza with strong chills and aching bones. It became widely popular as treatment for malaria and was brought back to Northern Europe where it naturalized. Boneset may have gotten its common name from being able to relieve “bone-breaking” fever (that which causes severe bone-pain), but it has also been traditionally used to help set and heal broken bones. As a bitter, it is also used to heal intestinal lining and appetite, post illness. I like to keep some on-hand during the winter months to add to a tonic tea when there is the first sign of chill that could be due to cold of flu. As a diaphoretic, it will help to increase heat and move it to the periphery of the body, helping to drive the pathogen out. Drinking it in a warm tea with other diaphoretic herbs like elderflower, yarrow and ginger can help ward off potential illness. If one does come down with feverish chills, use it in a tea with one of the above herbs and a little peppermint. Boneset herb can be added to any formula for mending bones, whether fractured, broken or worn as in osteoporosis. It stimulates circulation and may aid the liver, which plays a big part in connective tissue healing. To do this, make it a smaller part to a formula with comfrey, mullein and horsetail. Homeopathic Eupatorium can be used in higher potencies (30c to 200c) in bone healing where you don’t have the herb. Intermittent fevers affect the pore-size of the intestinal lining and can compromise digestion over time (antibiotics do this even more so). 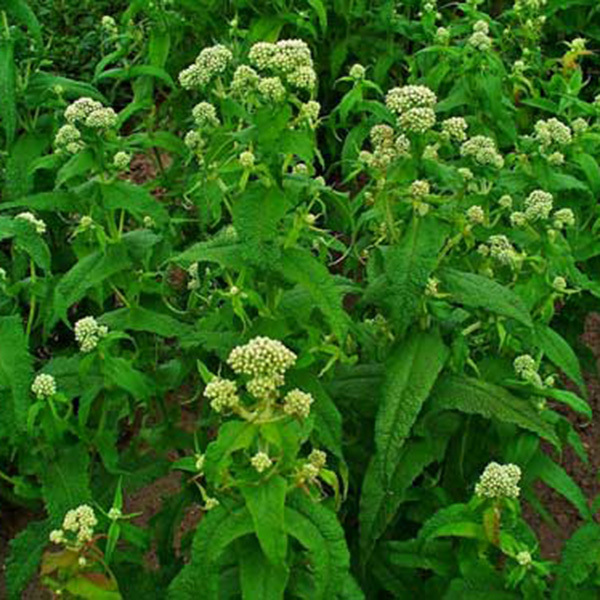 Boneset can help restore the integrity of the mucosal lining and help reboot the digestive process. This herb may also be of value in moving mucus that has gotten stuck and dried in the lungs. It is helpful with secondary respiratory infections that can result from having the flu. Boneset’s bitter quality makes it a liver and gallbladder stimulant and thus restores appetite. In this case the infusion is drunk at room temperature or cooler. Please Note: This herb is safe to use as needed for acute illness and recovery, however it is not for long-term continuous use as it does contain pyrrolizidine alkaloids, which can be toxic. Do not use in pregnancy.